A man who stabbed his friend to death must serve a minimum of ten years’ imprisonment before he can be considered for release by the Parole Commissioners. The man had consumed alcohol and drugs before fatally injuring his friend with a single stab wound. 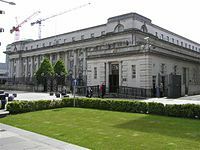 Having pleaded guilty to murder a month before his case was fixed for trial, the guilty plea was considered a mitigating factor, however His Honour Judge David McFarland said that the defendant could not receive the full credit due to the delay in his plea. On 7 April 2018, Mr Kenneth Cowan was at a friend’s house with the deceased, Brian Burke, where they spent the day listening to music and drinking beer. Mr Cowan had also been smoking cannabis. An argument broke out between Mr Cowan and Mr Burke, and at some stage Mr Cowan armed himself with a knife and stabbed Mr Burke once in the chest. Mr Burke’s lung was punctured, and the knife had entered his heart, causing extensive bleeding and “a fairly rapid death”. Mr Cowan called 999, remained at the scene, and made a full confession to being responsible for Mr Burke’s death during his first police interview. However, when Mr Cowan was first arranged before the Crown Court, he pleaded not guilty to the offence of murder. At this time, he was awaiting the results of a psychiatric assessment which may have allowed him to raise the issue of diminished responsibility. Mr Cowan’s trial was fixed for 7 January 2019, and he pleaded guilty to Mr Burke’s murder on 14 December 2018. Considering the minimum term to be served by Mr Cowan before he could be considered for release by the Parole Commissioners, His Honour Judge David McFarland considered the guidance on minimum sentences as set out in R v McCandless & Others  NI 269 and the Practice Statement by Lord Woolf CJ in May 2002 ( 3 All ER 417). Judge McFarland considered the victim impact report in respect of Mr Burke’s mother, his family, and his friends, who had set out the impact of Mr Burke’s death. His Honour Judge McFarland said, “this was a senseless taking of life of a young man, and it is natural that family and friends will struggle to rationalise what has happened”. Mr Cowan’s early guilty plea – although it was noted that Mr Cowan would not receive the full credit due to the delay in his plea and the impact of this delay on Mr Burke’s family and on witnesses who would have had to prepare for giving their oral testimony. In all the circumstances, Judge McFarland concluded that the appropriate minimum term of imprisonment would be 13 years – reduced to 10 years taking Mr Cowan’s guilty plea into account.